Ultra high quality mode conditioning patch cables for Gigabit Ethernet applications are required where Gigabit 1000 Base-LX routers and switches are installed into existing multimode cable plants. We offer Mode Conditioning cables in all varieties and combinations of SC, ST, MT-RJ and LC in 62.5/125 and 50/125. All our mode conditioning cables are proudly made in the USA and come with individual test results! Lead times vary, but are usually about 2-3 business days for production. Click on the configurations below for pricing and to purchase. Things to know when using mode conditioning cables to patch an existing multimode cable plant to your Gigabit LX equipment. 1) Mode conditioning cable are normally used in pairs. That means that you will need a MC cable at each end to connect the equipment to the cable plant. So then these cables are usually ordered in even numbers. The usual reason why someone may order one cable is so they may keep it as a spare. 3) Please see Frequently asked questions below for additional important information. The launch of the light coming out of the equipment begins on a Singlemode fiber. The Singlemode fiber is precision fusion spliced to the multimode fiber to a precise core alignment (see fig. 1). The light is launched on to the multimode fiber at a precise angle, giving the cable its mode conditioning properties. Looking at the mode conditioning cable assembly in figure 2, we can see that the fusion splice this protected by a black over-wrap. notice that on the right side there is an orange and a yellow cable. This is the side of the cable that connects to the gigabit equipment with the yellow Singlemode leg connecting to the transmit side. How do I run Gigabit Ethernet (LX) over my existing multimode fiber optic cable plant? Use a Mode Conditioning Cable. Is there a distance cutoff to where mode conditioning is not required? Generally, Mode Conditioning patch cords are required for link distances greater than 984 feet (300 meters). We have heard some case stories where that distance has been lesser or greater. To our experience, the distance of 984 feet (300 meters) is just a benchmark. Your results may vary according to various different equipment and field conditions. 1 week for orders of 40 to 100+ cables. Note: MT-RJ and MU cables may have higher lead times. Where can I find an equivalent to the CAB-GELX-625= for my Cisco Gigabit Network Equipment? Our 3 meter SC to SC Mode Conditioning patch cable is 100% compatible with the CAB-GELX-625= cable as specified Cisco for their Gigabit equipment, including the Catalyst family. Do all multimode fiber types require mode conditioning? Some manufacturers of the newer "high end" multimode fibers claim that that their premium line cables will not require mode conditioning. Contact the manufacturer of your installed cable for the answer. When I hold the yellow Singlemode cable up to a light, the light does not come through on the other side. Does this indicate that I have a defective cable? The core of the Singlemode cable is so small than it does not gather enough light for it to be visible without a microscope on the other side. this is a normal condition for any Singlemode cable . Can I use a mode conditioning cable to convert Singlemode to multimode or visa-versa? No. Conversions of multimode and Singlemode require Media Converters. The great demand for increased bandwidth has prompted the release of the 802.3z standard (IEEE) for Gigabit Ethernet over optical fiber. 1000Base-LX requires the use of a launch conditioning patch cord to allow for proper propagation of the laser VCSEL light along the multimode fiber. 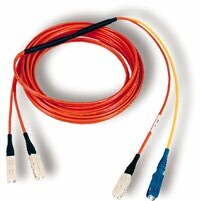 The Mode Conditioning Patch Cord is designed for long wave (-LX) multimode applications of Gigabit Ethernet. It is compliant with this IEEE 802.3z application standard. This patch cord consists of duplex SC connectors on each end of a cable assembly with a single-mode fiber offset to a multimode fiber connection point in between. The need for this patch cord is due to the single-mode launch nature of the -LX or long-wave (1300 nm) transceiver modules used for Gigabit Ethernet. These modules have to operate for both single-mode and multimode fibers. Launching a single-mode laser into the center of a multimode fiber can cause multiple signals to be generated that confuse the receiver at the other end of the fiber. These multiple signals, caused by Differential Mode Delay (DMD) effects, severely limit the cable distance lengths for operating Gigabit Ethernet. A mode conditioning patch cord eliminates these multiple signals by allowing the single-mode launch to be offset away from the center of a multimode fiber. This offset point creates a launch that is similar to typical multimode LED launches.